I’ve been working on a gallery wall for the past few weeks, and it ended up being a little harder than it looks. I needed a few pieces to complete it, and turned to Etsy. While I love browsing through different artists’ shops on Etsy, it can sometimes be intimidating. There’s so much to choose from, where does one begin? Here’s a roundup of a few of my favorite shops. Are there any artists on Etsy you love? Please share! Montreal-based artist Raymond Biesinger creates silkscreened art prints that sometimes have a historical or political context. One of my favorites, which I own, is this map of europe from 1919, which also functions as a RISK boardgame thanks to some cards he includes with the print. 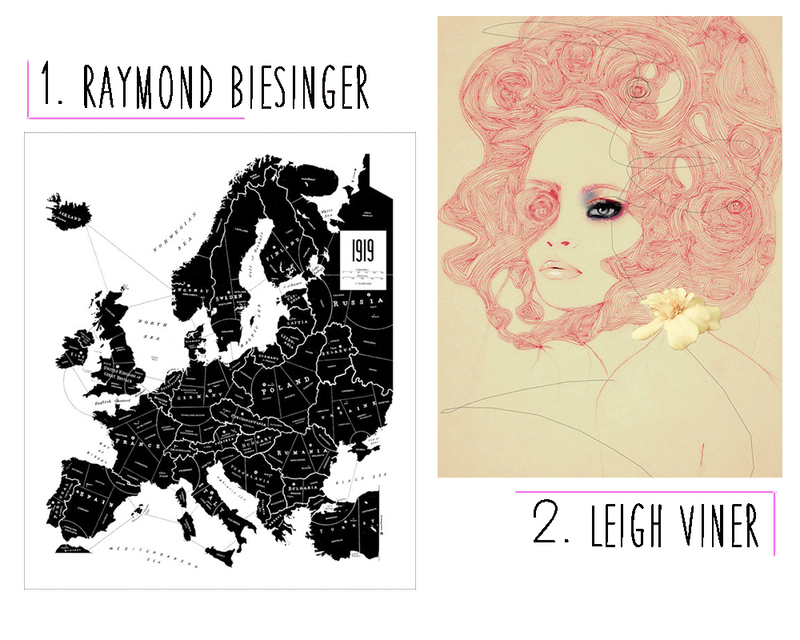 Colourful and feminine, Leigh Viner’s work captures what I love most about fashion illustration. The soft colours contrasted with strong makeup are often combined with collage and pretty scribbles. The women featured look beautiful with a usual hint of sadness to them, which is what makes the images so captivating to me. 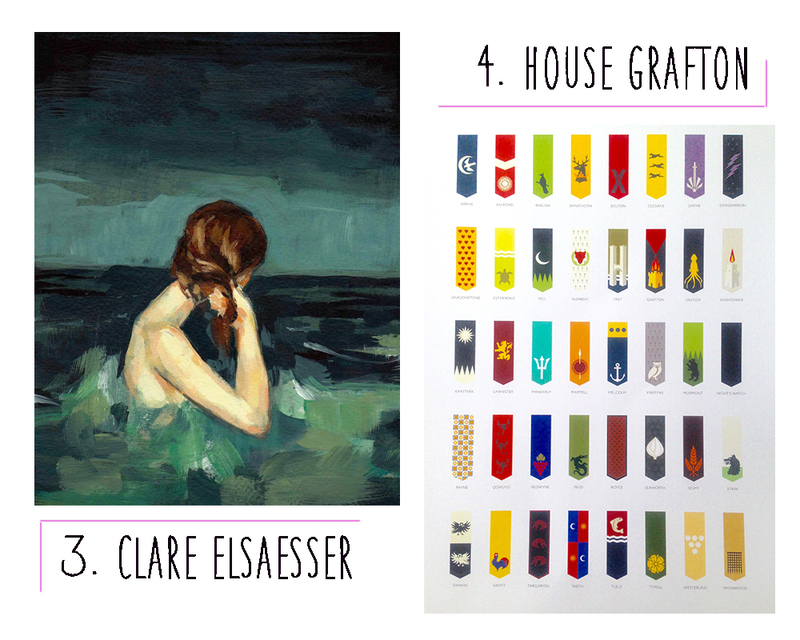 Clare Elsaesser paints timeless paintings of women and the sea, among other things. Textured brushstrokes capture the movement of the waves and the light that is uniquely found when one is at sea. I had a tough time choosing which one, as they all transported me to my own memories by the ocean. If you’re not a Game of Thrones fan, you probably at least know a few. I purchased this piece from House Grafton, an artist who made his own rendition of the Sigils of the Houses of Westeros. 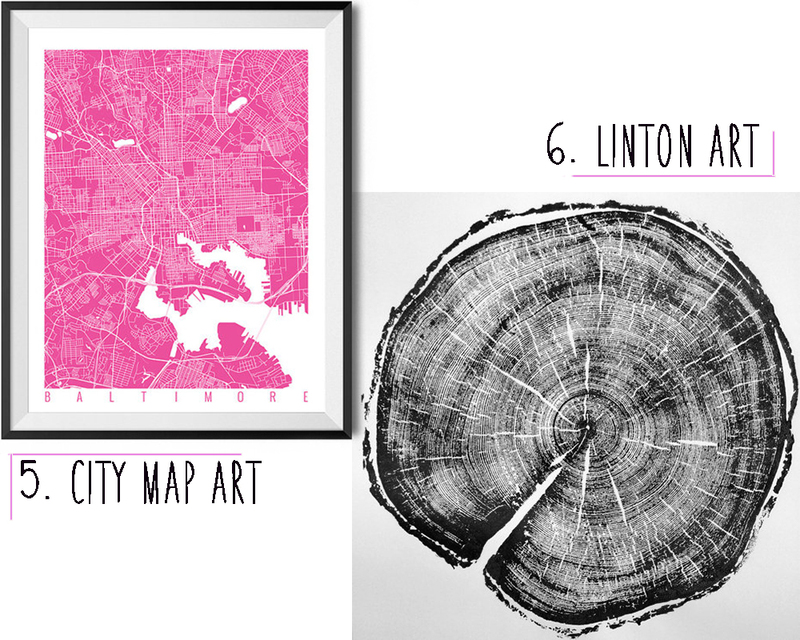 City Map Art offers prints of different city maps, but the best part is, you can choose between 48 different colours. Definitely makes things easier if you’re looking for that specific shade to match the colour pallet you are working with. I love the natural effortless art that is found in nature. These tree ring stamps offer a geometric quality to any room as well as a reminder that simple beauty surrounds us in all living things. These prints are all original pieces, no copies were made, and the trees are true to size. I love the city map art so much! I’ve always been fascinated by similar things so this is really cool. Yes and I think it’s a great way to keep a reminder of a place where you’ve travelled. They have so many awesome city maps on their page, it’s makes me want to go on a trip, really.